1408. Freeman Cobb Higgins Sr. was born on 10 October 1804 in Bucksport, Maine (Hancock). Listed as 39 yrs-old in 1850, making the birth year 1839 rather than 1805. In 1860 and 1870 he is listed as having been born in 1804/5. He lived in Bucksport, Maine (Hancock) in 1850. In 1850 he was a seaman in Bucksport, Maine (Hancock). Between 1860 and 1870 Freeman was . He lived in Bucksport, Maine (Hancock) in 1860. He lived in Bucksport, Maine (Hancock) in 1870. Freeman died on 21 July 1882 at the age of 77. He was 7/256 Wampanoag/Narragansett Indian, 1/64 (4/256) Wampanoag/Narragansett from father and 3/256 Wampanoag from mother at 1/32 Wampanoag/Narragansett Indian from father. Freeman Cobb Higgins Sr. and Mary Woodman were married before 1835 in Bucksport, Maine (Hancock). Mary Woodman was born on 7 November 1814 in Frankfort, Maine (Waldo). She lived in Bucksport, Maine (Hancock) in 1850. She lived in Bucksport, Maine (Hancock) in 1860. Mary lived in Bucksport, Maine (Hancock) in 1870. She died on 22 November 1883 at the age of 69.
ii. 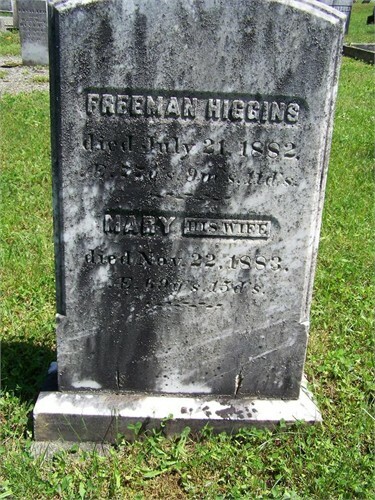 Hannah I. Higgins was born on 24 October 1837 in Bucksport, Maine (Hancock). She lived in Bucksport, Maine (Hancock) in 1850. She lived in Bucksport, Maine (Hancock) in 1860. Hannah lived with her parents in Bucksport, Maine (Hancock) in 1870. She was 7/512 Wampanoag/Narragansett Indian from father. iii. Mary Higgins was born on 22 October 1839 in Bucksport, Maine (Hancock). She lived in Bucksport, Maine (Hancock) in July 1850. She was 7/512 Wampanoag/Narragansett Indian from father. iv. Elisha Higgins was born on 15 March 1842 in Bucksport, Maine (Hancock). He lived in Bucksport, Maine (Hancock) in 1850. He lived in Bucksport, Maine (Hancock) in 1860. In 1860 Elisha was a seaman in Bucksport, Maine (Hancock). He was 7/512 Wampanoag/Narragansett Indian from father. v. Freeman Cobb Higgins Jr.-104225. vi. Nehemiah Higgins was born on 18 October 1846 in Bucksport, Maine (Hancock). He lived in Bucksport, Maine (Hancock) in 1850. He lived in Bucksport, Maine (Hancock) in 1860. Nehemiah lived with his parents in Bucksport, Maine (Hancock) in 1870. In 1870 he was a sailor in Bucksport, Maine (Hancock). He was 7/512 Wampanoag/Narragansett Indian from father. vii. Charles E. Higgins was born on 2 August 1848 in Bucksport, Maine (Hancock). He lived in Bucksport, Maine (Hancock) in 1850. He lived in Bucksport, Maine (Hancock) in 1860. Charles lived with his parents in Bucksport, Maine (Hancock) in 1870. In 1870 he was a sailor in Bucksport, Maine (Hancock). He was 7/512 Wampanoag/Narragansett Indian from father. viii. William W. Higgins was born in 1852 in Bucksport, Maine (Hancock). He lived in Bucksport, Maine (Hancock) in 1860. He lived in Bucksport, Maine (Hancock) in 1870. In 1870 William was a sailor in Bucksport, Maine (Hancock). He was 7/512 Wampanoag/Narragansett Indian from father. ix. Benjamin Higgins was born in 1857 in Bucksport, Maine (Hancock). He lived in Bucksport, Maine (Hancock) in 1860. He was 7/512 Wampanoag/Narragansett Indian from father.